Issues with flooding in the Darwin region are largely dependent on locality. A number of areas have historically experienced flooding associated with unmitigated stormwater flows. The Darwin Region Flood Mitigation Report recommended several structural and non-structural flood mitigation options for Rapid Creek, Ludmilla, Yarrawonga and Wadham Lagoon in Howard Springs. For information on the range of structural and non-structural flood mitigation options, read what is flood mitigation. For the latest update on flood mitigation projects go to the latest updates page. The Darwin Regional Flood Mitigation Advisory Committee was formed in January 2015 and tasked to provide recommendations to mitigate the impact of flooding in the Darwin region. The committee released its final report in August 2015 and is no longer active. The department is undertaking the implementation of the recommended measures as per the committee's report for the following key areas of Rapid Creek, Ludmilla, Yarrawonga and Wadhaw Lagoon Howard Springs. Read the Final Darwin Flood Mitigation Report (2.2 mb). Flooding can occur in the Rapid Creek catchment when heavy rain combines with high tides to cause flood water to back up into the creek and flood low-lying properties. During Cyclone Carlos in 2011, approximately 67 properties were impacted by inundation of floodwater from Rapid Creek. The Northern Territory Government is working to alleviate the impact of flooding in the Rapid Creek catchment. Construction of a detention basin, combined with other flood mitigation measures, will reduce the impact of flooding on downstream properties. A detention basin will be built on the corner of McMillans Road and Henry Wrigley Drive in Marrara to temporarily hold stormwater flows from Anula, Moil and parts of Marrara. The construction tender was re-released in early 2018 after low levels of Per- and Polyfluoroalkyl Substances (PFAS) were identified within soils at the detention basin site. The Department has undertaken environmental testing in accordance with the National Environment Protection Measure (NEPM) guidelines, which has shown soils within this site to have low levels of Per- and Polyfluoroalkyl Substances (PFAS) present, significantly below the Health Based Guidance Values for PFAS. Management of excess soils from this project will be undertaken in accordance with independent environmental advice and endorsed by NTEPA. The design of the basin seeks to retain as much native vegetation as possible, with land to be cleared for the perimeter embankment only, while the excavation for the basin floor is in the previously cleared part of the site. When complete, the basin floor and embankment will be grassed to stabilise it against erosion and promote infilitration to groundwater, while remaining free draining, detaining water generally no longer than 24 hours after a large rainfall event. The basin is designed to slowly fill from the inside out (see image above) and at capacity will detain water in a large Q100 rainfall event (i.e Cyclone Carlos) with outlets fenced for safety reasons. On completion the primary purpose of the area will remain as open space given it will remain dry when it is not raining. Construction of the detention basin is expected to be completed at the end of 2018. An early warning system has been put in place to help residents prepare for the risk of potential flooding and enable them to activate their emergency household plan. NT Emergency Services monitors the conditions of Rapid Creek in the event of heavy rainfall. A warning is triggered in the event that Rapid Creek rises to a level that is considered a flood risk, whereby NT Emergency Services will give warning to impacted residents. For more information on how prepare a household emergency plan go to securent.nt.gov.au. River height information for Rapid Creek can be found on the Bureau of Meteorology’s website. NT Airports has committed to undertaking flood mitigation works to manage stormwater runoff from the Darwin International Airport as recognised in their master plan 2017. The Department has worked with Power and Water Corporation to install back-flow prevention devices into homes that are at risk of sewerage inundation during heavy rainfall events. Rapid Creek is a well-functioning system and will be retained in its current state. A strategy has been put in place to ensure the infrastructure in the creek, such as culverts and bridges, are maintained and continue to work efficiently. re-establishment of Ludmilla Creek trunk drain. There are significant issues with drainage in the Yarrawonga industrial areas, with flooding occurring in relatively small rainfall events. The Northern Territory Government is working to alleviate the impact of localised flooding in the Yarrawonga catchment. upgrading stormwater drainage along Tulagi Road. The City of Palmerston has upgraded Yarrawonga Road and Wallaby Holtze Road including upgraded drainage. Stormwater drainage is expected to be upgraded in the western area of the industrial estate, near McKenzie Place, by late 2019. Flooding occurs around Wadham Lagoon in Howard Springs with a number of private properties affected during large rainfall events. 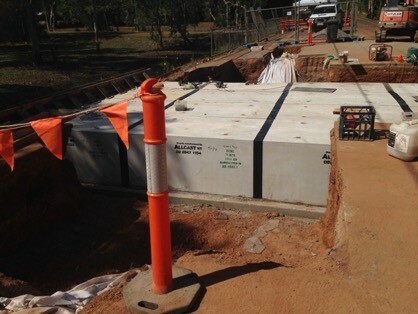 Stage two: upgrading sections of the trunk drain between Whitewood Road and Howard Springs Forestry Reserve outfall and relocate underground Telstra communications and water mains at road crossings along the trunk drain. The Wadham Lagoon flood mitigation project will increase the capacity of trunk drainage to cater for flood stormwater flows in large rainfall events. The flood model over this catchment will inform assessment of future developments in the Howard Springs activity centre to manage stormwater to pre-development flows. Stage one has been completed with new culverts installed beneath Whitewood Road in mid-2017 (see image above). Stage two is expected to be completed by the end of 2019. During Cyclone Carlos in 2011, significant flooding of properties occurred in Lorikeet Court in Herbert. Works were completed by mid-2015 comprising drainage upgrades and new culverts to mitigate flooding. Wells Creek Road is frequently closed during monsoonal rains. Investigation and analysis of the catchment is currently in process. A number of rural properties are impacted by inundation during monsoonal rain and cyclonic storms on the Elizabeth River.